Anything by Gardein. This all-vegan company can’t do anything wrong. I guarantee you will love it all! Breakfast pockets, beef and chicken sliders, beef burger, gluten-free burger, beef and chicken strips, meatballs, several flavors of chicken filets, ground beef crumbles, BBQ riblets, meatloaf, fish fillets, chicken patties, nuggets and fingers, Sloppy Joe's, beef tips and skewers, BBQ pulled pork shreds, sausage patties, turkey cutlets and roasts, BBQ wings and buffalo wings! Anything by Turtle Island Foods, the makers of Tofurky®. The oven-roasted, peppered, hickory-smoked, bologna, Italian and roast beef deli slices are simply phenomenal. They also have pepperoni slices, 3 pizzas, Italian sausage, beer bratwursts, kielbasa, franks, breakfast links, jerky, ground tofurky (ground beef and chorizo) and 4 flavors of tempeh strips (smoky maple bacon, sesame garlic, coconut curry and lemon pepper). Beyond Meat is taking the world by storm! The chicken strips and beef crumbles are so meaty, they even fooled most of The Today Show crew in April 2014! And the burgers taste frighteningly just like cow-flesh. I guarantee you will love ‘em! Anything by Sophie's Kitchen. They have breaded fish fillets, breaded shrimp, shrimp, calamari, squid, smoked salmon, canned tuna and prawns. The main ingredient is elephant yam root, also known as Konjac (pronounced KOUN-JAEK). Anything by Sweet Earth. Their bacon is the best on the market. And the burritos are delicious! Check their site for many other vegan items as well! Sol is an all-vegan gluten-free company that makes chicken chunks, burgers, crumbles, sliders, ribs, breakfast patties and falafel. All six soy-free/gluten-free Organic Sunshine Burgers. They use sunflower seeds and brown rice as the base. The different flavors are BBQ, Hemp & Sage, Falafel, Garden Herb, Black Bean and the Original Quarter Pound. BBQ is my favorite. Check out its ingredients: Organic cooked brown rice, organic ground raw sunflower seeds, organic cooked pinto beans, organic rice syrup, organic onion, organic paprika, organic garlic, sea salt, organic black pepper and natural smoke flavor. The organic soy-free/gluten-free Original and Chipotle burgers by Asherah's Gourmet. They use quinoa as the base. Check out the ingredients for the Original: Organic quinoa, organic sweet potatoes, organic carrots, organic coconut flour, organic onion, organic red bell pepper, organic spices, organic garlic powder, Redmond's real salt (contains over 50 trace minerals) and organic flax meal. The soy-free/gluten-free Adzuki Bean and World's Best Veggie Burger by Hilary's Eat Well. Check out the ingredients for the World's Best: Millet, quinoa, expeller-pressed coconut oil, spinach, onion, garlic, psyllium husk powder, arrowroot, sweet potato, real salt, apple cider vinegar and sunflower seed oil. Lightlife vegan products are fantastic! Check out the chik'n strips, steak strips, smart bacon, smoky tempeh bacon, pepperoni, plus the ham, bologna and turkey deli meats. The citrus sparerib cutlets by Vegetarian Plus are fantastic. This company has some other VEGAN products like tuna rolls, orange chicken, shrimp and kung pao chicken. But make sure to read the ingredient list for other Vegetarian Plus products because some of their foods are only vegetarian (containing eggs or dairy). Any of Worthington's canned goods are wonderful, especially their dogs, chili, and skallops. However, the canned TUNO fish is horrible! Don't buy it. They used to make a frozen version of TUNO, which was utterly amazing, but they've stopped making it for some reason. Chicken patties and nuggets, buffalo wings, potstickers, spring rolls, egg rolls and munchees by Health Is Wealth. Boca vegan burgers. Boca has a huge line of veggie goods but most are only vegetarian (containing eggs or dairy). 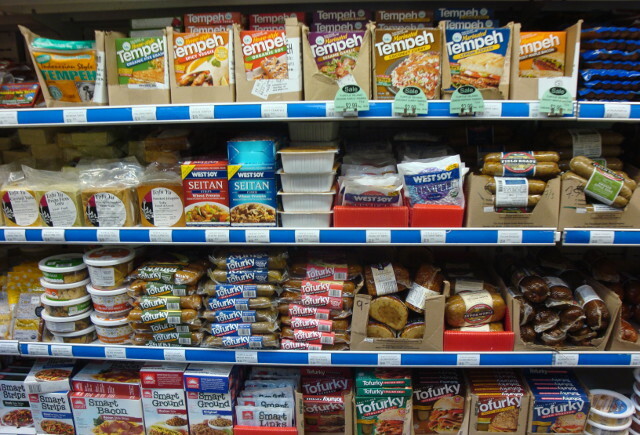 Yves has a huge selection of great-tasting vegan items: pepperoni, Canadian bacon, sausage patties, chicken and steak strips, ground beef and turkey crumbles, and bologna, ham, turkey, salami, roast beef and smoked chicken deli slices! Stuffed Celebration Roast by Field Roast Grain Meat Co. This roast is made from wheat (seitan) and it's remarkable! I've only seen this at Whole Foods so far. They also have three flavors of amazing cheese slices (see the DAIRY segment below). Anything by Five Star Foodies. They have a FANTASTIC soy-free/gluten-free vegan burger made with artichokes! Anything by Bahama. They're a soy-free/gluten-free vegan company that uses rice as the base. They offer five flavors of rice burgers, plus sausage and meatballs. Food For Life has Cluckphrey chicken patties and nuggets, and Moophrey burgers. They also have nine gluten-free vegan breads. Match veggie meats are super good. They have beef, chicken, crab, pork and sausage. Upton's Naturals has four insanely delicious, ready-to-eat wheat meats (seitan) in the following flavors: Ground beef, Italian sausage, Chorizo and traditional. Melissa's also has Soyrizo, a soy-based vegan chorizo. For the best-tasting vegan jerky around, order Scott Backman’s homemade Zola Jerk, or email him directly at zolajerk@gmail.com. It comes in four flavors: Red Pepper Flake, Thai Peanut, Teriyaki and Tangy BBQ. Check out the soy-free, gluten-free Just Mayo by Hampton Creek Foods. They also make cookies and ready-to-eat raw cookie dough.